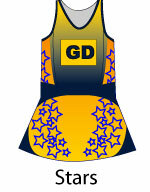 Netball Dresses from Netball Proshop − The Netball Uniform, Equipment and Rule Specialists. Made to order. Up to 4 weeks' production time. This is our premium A-line dress. The concept and design was generated through continuous customer feedback and trials on court. The dress is flared at the hips and a little less fitted as compared to our micro mesh dress, while still maintaining a flattering shape. The dress is manufactured from a premium Liquid Titanium yarn which increases blood circulation, awareness levels and comfort during play. The dress also features panels of lycra mesh knitted with larger eyelets in zones of heavy perspiration for greater airflow. 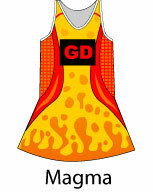 The dress can be sublimated to match almost any design you can imagine. 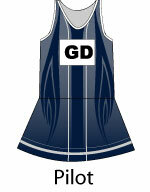 Colour matching to your existing design or club colours is available for no extra charge. 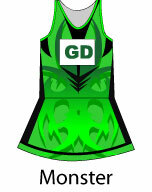 Custom logos or designs will be subject to a one off $60 setup fee if not charged previously on any other sublimated gear. Minimum initial order of 8 items. Please note designs shown here would be adapted to this product. 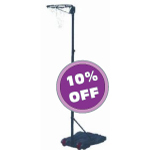 10% off Freestanding height adjustable lightweight portable stand. Order now and save.